Brewed in 2008, Aperitif is an aged sake made with premium Miyamanishiki sake rice highly polished to the lofty daiginjo levels of 40%. 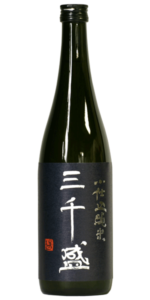 Aged sake is extremely rare and notoriously difficult to brew. The colour is dark amber like aged whisky and the aroma is deep and rich with notes of walnuts, spices, mushroom and malt. Aperitif is subtly sweet and the rich toffee, barley and nutty flavours are complex and layered. Aperitif is reminiscent of a slightly sweet sherry and can be served – as the name suggest – before a meal but it works equally well as a dessert wine paired with cheesecake or crumble – or indeed with cheese – or simply as a delicious and spoiling after dinner drink.